Embarrassed as I am by my procrastination, I have finally completed this post about my introduction to Scottish Breakfast Tea. Months earlier I was the happy recipient of five packets of the blend as a runner-up in a giveaway held by Purest Green on her Scotland for the Senses blog. 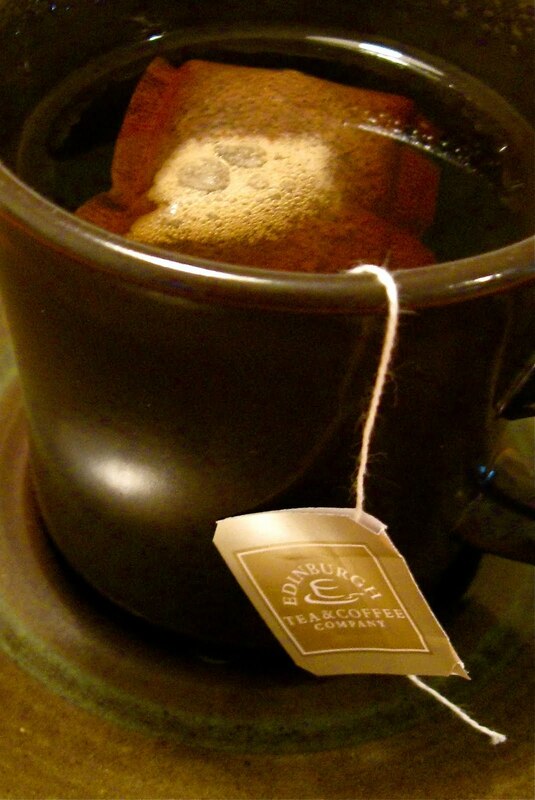 I love hot tea, and my favorite until now has been Twinings’ English Breakfast Tea. The Scottish version, a product of the Edinburgh Tea & Coffee Company, is Purest Green’s favorite brand and the one she drinks most often. It is definitely in the running for the top spot for me, too. My taste test started well before the first sip. Combining to fill both the senses of touch and sight were the texture of the packet containing the tea bag and the packet's understated elegance. The subdued gold of the logo stood out on a gold tint. A white border and attractive typography in white and black added the finishing touches. Good graphic design lifts my spirits, a leftover from working with a gifted designer during my days of formal—as in paid—employment. 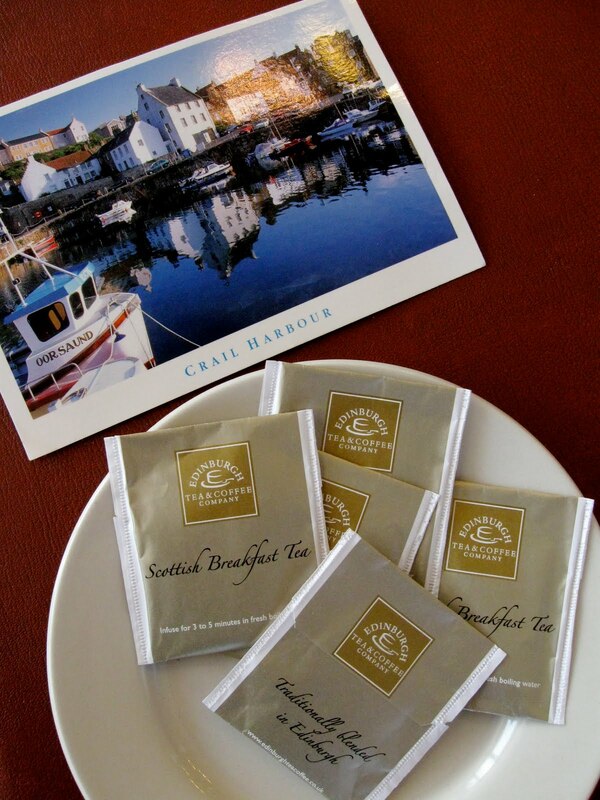 Adding to the enjoyment was the fact that the word “Scottish” now conjures up for me romantic castles, mysterious ruins, dramatic terrain, beautiful walks and fabulous food and drink, thanks to Scotland for the Senses and a number of other blogs about Scotland. In my first test, opening the packet released a light floral scent. I did not notice that in subsequent tests, but the hint of a floral taste and the lightness and smoothness was a pleasure. Even though like many Americans I am addicted to a sweet taste, this tea would make it possible for me to abandon the artificial sweetener with which I abuse my cups of tea. Directions on the packet said to infuse for 3 to 5 minutes. I experimented with varying the times, and about 1 minute was best for me. Obviously I prefer my tea not real strong. I followed up on the taste tests by going online to check out prices with an eye to making a purchase. Alas, the company only delivers within the United Kingdom! Thanks again, Purest Green, for hosting such an interesting contest and for giving me a teatime travel experience without my ever leaving home! My favourites is Lady Grey; thanks for sharing the whole tea-drinking experience from an American perspective.